Healthy banana muffins are low in sugar and high in healthy fats. 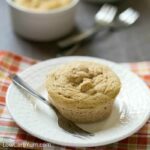 These keto banana nut muffins are also dairy-free, gluten-free, and paleo friendly. 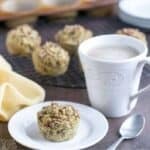 Is a banana nut muffin healthy? Ripe bananas are loaded with sugar so they aren’t the best ingredient for healthy muffins. And when it comes to low carb eating, you’ll want to minimize or avoid bananas. 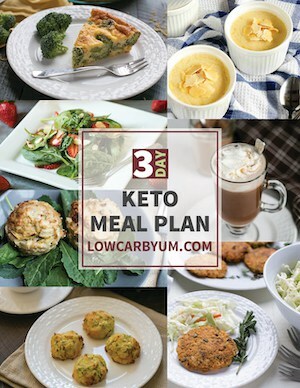 My low carb banana bread and banana split cheesecake use only a small amount per serving. The other problem is the wheat flour. It’s high in carbohydrates and contains gluten which can trigger gut inflammation. This can lead to a condition known as leaky gut where things that shouldn’t leave the gut do like undigested proteins. Although a banana nut muffin may contain beneficial nutrients, the high sugar and carbohydrates along with gluten make it an unhealthy choice. 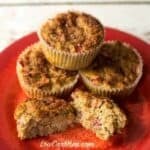 But, it’s easy to make a healthy banana muffins using alternatives to banana and wheat flour. You can still have the flavor without the sugar by using a banana extract instead. 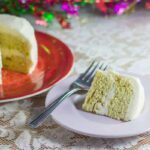 The extract is often used to make keto friendly desserts like my banana cream pie and low carb banana pudding. When removing the mashed bananas from the recipe, I wanted to use another fruit to make up for the volume. There aren’t a lot of low carb choices other than berries. However, avocado is a fruit that’s a good source of healthy fats as well as being low in carbohydrates. So I decided to try using an avocado in my easy healthy banana muffins recipe. And each muffin tastes great despite the slight green tint. 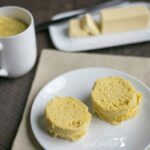 It may look a little different, but it’s so much better for you than the traditional high carb muffins! And if you’re on a keto diet, you’ll love that there’s a good amount of fat. I calculated 30 grams of total fat in every muffin. 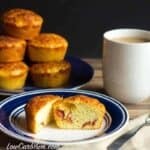 So these muffins are not just healthy, they are very filling as well. The two main food sensitivities are gluten and dairy. So you’ll find neither of those in this recipe. 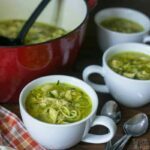 I do use three whole eggs, but the recipe may work with one of the many egg substitutes like psyllium or flax with added water. 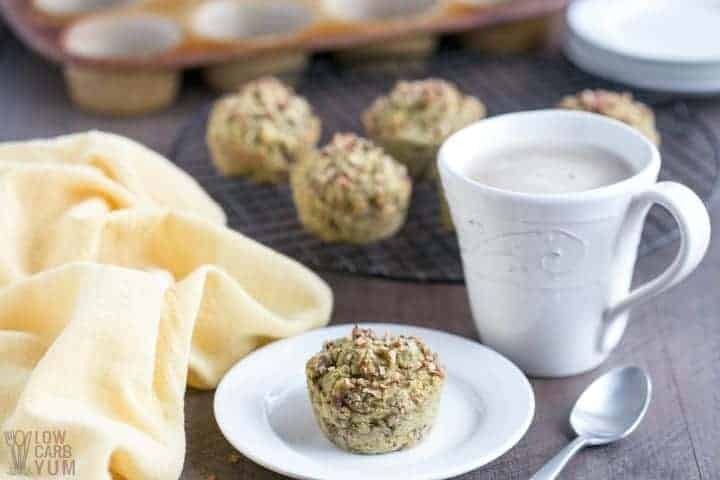 A blend of coconut flour and almond flour are used to make the muffins keto friendly and gluten-free. There’s also some salt, cinnamon, and baking powder mixed into the low carb flours. 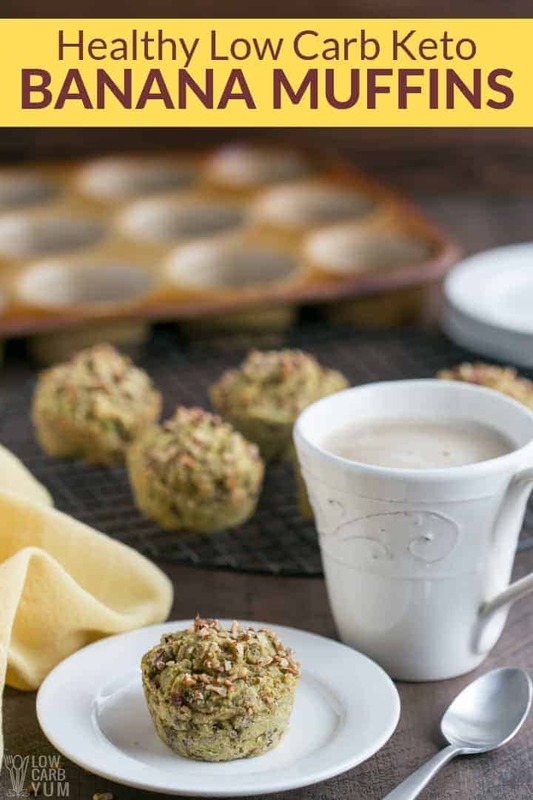 To make the muffins without erythritol, pure stevia and monk fruit extracts are used to sweeten the muffins. Of course, you can always use a sweetener that you prefer. The stevia and monk fruit can be replaced with any sweetener equal to about ½ cup sugar. 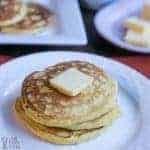 The sweeteners are blended with coconut oil, eggs, banana extract, and vanilla extract. If you don’t care for coconut oil, butter or ghee can be used instead. Butter flavored coconut oil is also an option. Once the flour blend is mixed into the wet ingredients, it turns into a thick batter. 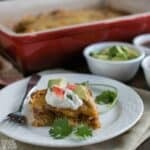 The mashed avocado and chopped pecan are then added in. Finally, the batter is divided between six greased muffin tins. The healthy banana nut muffins are baked at 350°F for 25 to 30 minutes. I like to bake them in a greased stoneware muffin pan. But a silicone or a metal non-stick muffin pan works well too. After baking, the cooked muffins should sit for about 15 minutes before removing from the pan. If the pan was well greased, they should come out without sticking. However, I find it’s best to slide a knife around the sides first then use the knife to lift each muffin out of the pan. 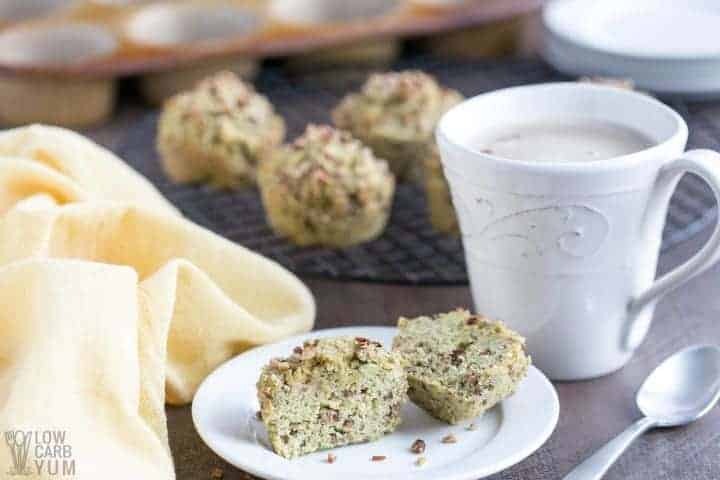 This healthy recipe uses a blend of almond flour and coconut flour to replace the all purpose flour that’s used in regular muffins. 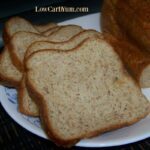 This gives a similar texture without the carbs and gluten found in white whole wheat flour. Coconut flour is very absorbent so it usually requires using more liquid when used as the only flour. 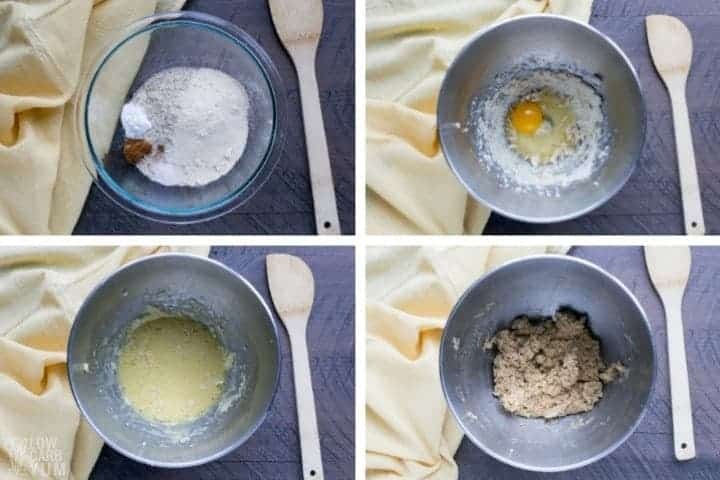 However, the absorbency of the flour can vary so you may find that only 2 or 3 tablespoons of coconut flour are needed to make the muffins instead of the ¼ cup. I also find that it’s best to let the batter sit for about 5 or 10 minutes before baking to allow the coconut flour to absorb the liquid. And it’s always a good idea to measure the coconut flour sifted as it tends to be lumpy. 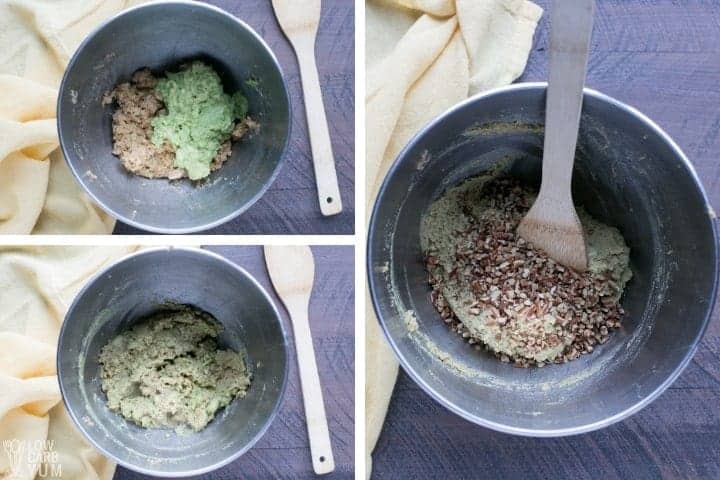 Almond flour can be used one for one in place of regular wheat flour. However, since there’s no gluten, it typically results in flatter and denser baked goods. That’s why I like to blend a little coconut flour into almond flour. It helps give a better rise than using almond flour alone. There’s also some awesome looking low carb cinnamon rolls muffins over at The Big Man’s World. 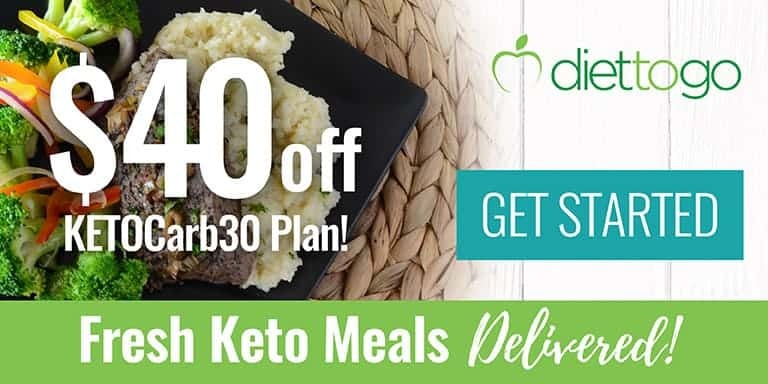 Not only are they low carb, but they’re also paleo and vegan. Preheat oven to 350°F. Grease six muffin molds. Beat coconut oil with monk fruit and stevia powdered extracts. Beat in eggs, one at a time. Then beat in banana and vanilla extracts. In a separate bowl, combine the coconut flour, almond flour, salt, cinnamon, and baking powder. Then blend into coconut oil mixture. Beat in mashed avocado. Then fold in nuts, saving about 2 tablespoons to sprinkle on top of muffins. 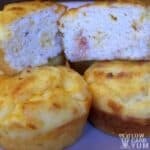 Divide batter evenly between six greased muffin molds. Sprinkle reserved pecans on top. Bake at 350°F for 25 to 30 minutes or until toothpick inserted at the center comes out clean. 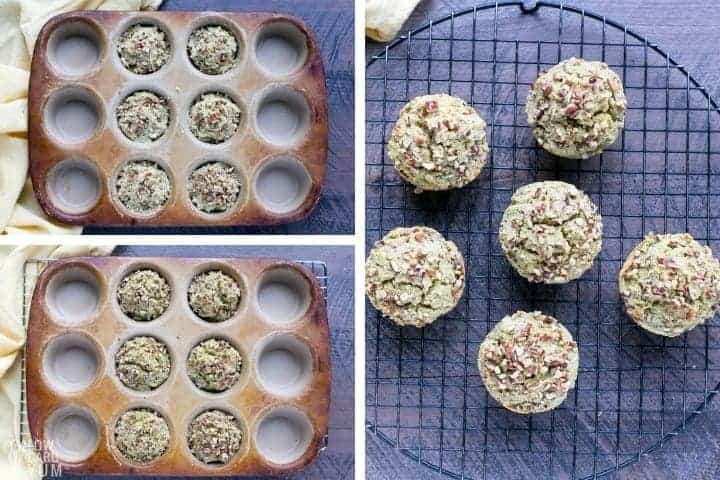 4g NET carbs per muffin. About 1/2 cup low carb sweetener can be used in place of the monk fruit and stevia extracts.